eCite - Establishing school university partnerships to teach science - Does what worked for us work for you? Establishing school university partnerships to teach science - Does what worked for us work for you? Concerns over the quality and amount of science teaching in Australian primary schools has led to a concentration of research on the methods of delivery of science education. There is a growing interest in both Australian and International contexts on building teacher knowledge and confidence to teach science, how science is taught at the primary school level and also how pre-service teachers are prepared to teach science. The Science Teacher Education Partnerships with Schools (STEPS) project is one response to these concerns. The STEPS project is a collaboration of five Australian universities that each independently set-up their own school-based partnership approaches with schools to deliver their science education programs. Each university aimed to provide pre-service teachers with the genuine experience of teaching science while being supported by university teaching staff. 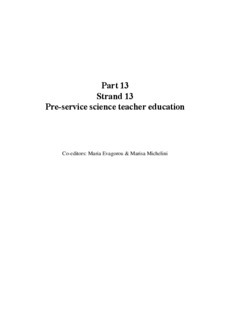 The project has drawn on feedback from pre-service teachers, teachers, principals and teacher educators involved at the five universities to examine the prevailing practices and led to the development of a set of tools and process, referred to as the Interpretive Framework (IF) (Hobbs et al. 2015). The IF describes how to create and maintain effective partnerships with schools, based on this research. This current paper reports on a survey conducted in 2014 which aimed to feedback from teacher educators across Australia to explore the extent to which school-based teaching opportunities in science for PSTs were in use across the country and to identify the range of approaches and theories driving their practices. Some respondents were followed up for interview and key factors were analysed and reported here. These data will be used to further refine the IF.